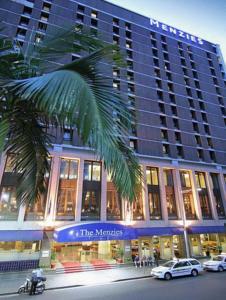 Located in the heart of central Sydney, The Menzies Sydney offers access to a heated swimming pool and fitness center. Guests have a choice of 3 bars and 2 restaurants. Each spacious room at The Menzies features high ceilings and a marble bathroom. Some rooms also have views overlooking Wynyard Park. Internet access and 24-hour room service are available. Parkside Restaurant offers Modern Australian cuisine and The Carrington serves a buffet breakfast each morning. Guests can relax with coffee, cocktails and other drinks at the hotel’s 3 bars. The Menzies is a 2-minute walk from Wynyard train station and is across from a bus terminal, providing easy access to Sydney’s attractions. Sydney Opera House, Circular Quay and The Rocks district are a 15 minute walk away. Rooms: Hotel Rooms: 446, Hotel Chain: Novotel. Public parking is possible on site (reservation is needed) and charges apply. Free! Up to two children under 16 years stay free of charge when using existing beds. There is extra beds/baby beds in a room is 0 capacity for extra beds/cots in the room.